The bar was raised today to level 5 with new Cloud Infrastructure Suite. Of course there is many new features introduced which you might read on all the other blog post articles, but I will choose some of them which is interesting in my point of view. Some of the features for the SMB market too has been introduced. The event was held online and even here at Reunion Island the sound was clear and I certainly enjoyed the show. The rain of tweets on my Tweetdeck was impressive too… -:). This blog post is special. I’ll try to make a mix of what I saw during the event and also what I was able to read on other fellow blogger’s websites. But the amount of informations if just …. phenomenal…..
New HA introduced – There is completely new High Availability agent introduced. As You know that in vSphere 4 there has been AAM used as an agent to communicate between hosts. Now with vSphere 5 it’s the role of FDM – Fault Domain Manager. The principal heartbeat network ist still the management network, but there is a secondary channel through Datastore heartbeating introduced, which permits HA to define if a host is isolated or if a host is failed. A quick quote form Eric Sloof’s blog post: When you create a VMware HA cluster, a single host is chosen as the master host to communicate with vCenter Server and to monitor the state of the other, slave, hosts and their virtual machines. Different types of host failures are possible and must be detected and appropriately dealt with. To do this, the master host must distinguish between a failed host and one that is in a network partition. Datastore heartbeating is used to do this. New SRM 5 – Site Recovery Manager – which will be able to replicate on different types of array….. and has got a built in vSphere replication. – 32-way virtual SMP. ESXi 5.0 supports virtual machines with up to 32 virtual CPUs,which lets you run larger CPU-intensive workloads on the VMware ESXi platform. – 1TB virtual machine RAM. You can assign up to 1TB of RAM to ESXi 5.0 virtual machines. – Nonhardware accelerated 3D graphics for Windows Aero support. ESXi 5.0 supports 3D graphics to run Windows Aero and Basic 3D applications in virtual machines. – USB 3.0 device support. ESXi 5.0 features support for USB 3.0 devices in virtual machines with Linux guest operating systems. USB 3.0 devices attached to the client computer running the vSphere Web Client or the vSphere Client can be connected to a virtual machine and accessed within it. USB 3.0 devices connected to the ESXi host are not supported at this time. – UEFI virtual BIOS. Virtual machines running on ESXi 5.0 can boot from and use the Unified Extended Firmware Interface (UEFI). 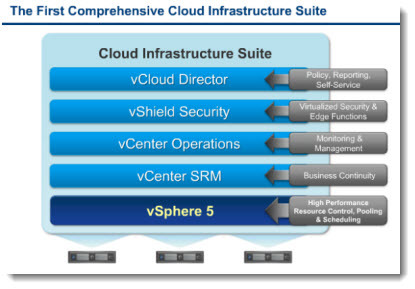 Storage Enhancements – New VMFS version 5 has been introduced and Storage DRS was introduced. The maximum size of a datastore has been increased to from 2 TB to 64 TB. The maximum filesize of a virtual disk file (VMDK) remains 2 TB. VMFS5 is a base for the next release of VMFS which will have more efficient snapshotting. vSphere Storage DRS – automatic load balancing of VMDK files between datastores, based on I/O performance and capacity. If storage space get’s lower under certaint lever (let’s say less than 15% of free space), the Storage DRS will perform automatically (or recommends) storage vMotion into a datastore with more space and less I/O. 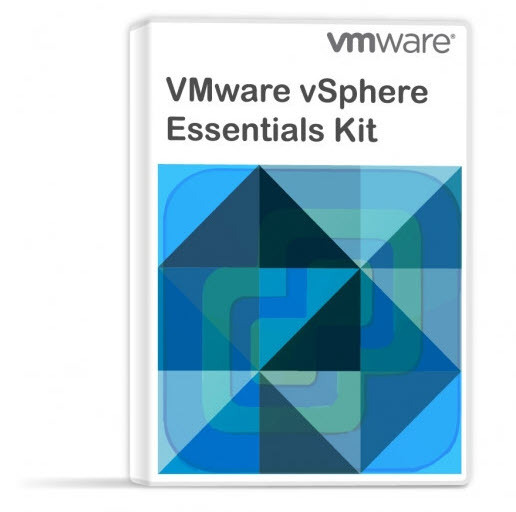 Now, I’d like to go more deeper on one of those features for the SMB market – VMware Storage Appliance (VSA). 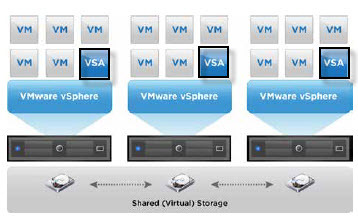 The vSphere Storage appliance (VSA) is using the local disks of each server. It’s a VM which executes itself on each of the hosts. Brings a new possibilities to SMBs which can’t afford to buy expensive SAN shared storage. If one server fails, automatically the VSA fails over to another server in the cluster. It’s an easy to deploy OVF package which is managed through vCenter Server through a plugin. It supports up to 3 physical hosts. It uses Raid 1 across different nodes and Raid 10 within each node. The VSA uses the space on the local disks to present one NFS volume which is replicated between those 3 physical servers. Permits to leverage local storage (DAS) to implement features like HA and vMotion, which are features only possible to implement on a shared storage like NAS or SAN. And when it comes to future upgrade of hardware (if the company grows), it’s possible to use Storage vMotion to tranfer VMs from the VSA to shared storage without downtime. As a best practice VMware recommends to run vCenter Server separately from the VSA cluster for best protection. For the physical disk capacity, plan before you deploy, since disk capacity and VSA-node count cannot be changed. A 2 servers scenario and 3 servers scenario. In 2 servers scenario you must have 2 ESXi 5.0 installed an the installer deploys one VSA per server. During the configuration, the datacenter must be selected, and in that view one then selects the ESXi 5.0 hosts which will participate in the VSA cluster. 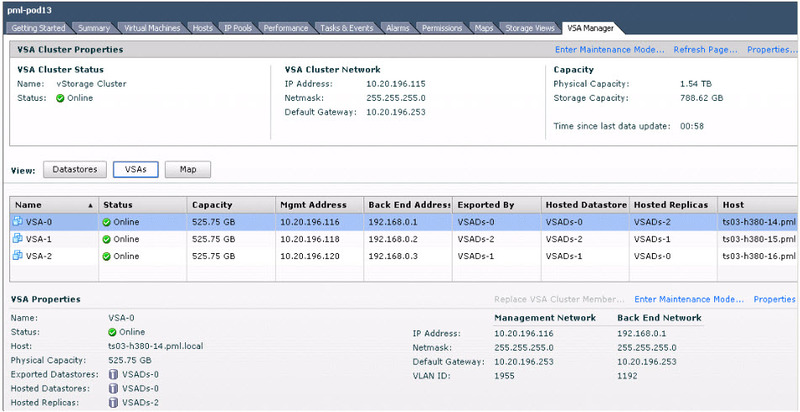 VSA then creates the storage cluster. You can see how the replicas are distributed on the ESXi 5.0 local disks on the images below. VSA Manager – The deployment and monitoring process is handled by VSA manager which is a new vCenter Plugin, through which the administrator can deploy the vSphere storage appliance copies on the ESXi hosts and create the storage cluster. Mount an NFS volumes which are exported as a datastores on each of the hosts which participate in the storage cluster. Also the monitoring and troubleshooting process is handled through the VSA manager. VSA can handle one node failure. If failure occurs, the NFS datastore is presented to the surviving hosts from the replica. There is also a maintenance mode available, which helps to handle the planned maintenance on server hardware. The user can put one node into maintenance mode to make a hardware maintenance or reconfiguration changes to that particular node (for upgrade for example). No need to migrate the VMs elsewhere since only one node has been taken offline. If one VSA member fails, the admin has the possibility to Replace VSA cluster member. And a new video done by David Davis, from SF where he speaks with Ed Hsu from VMware about the vSphere Storage Appliance.